My new leftover workingman board. 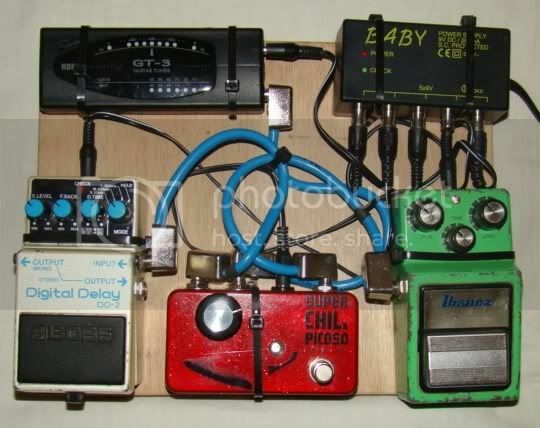 Discussion in 'Effects, Pedals, Strings & Things' started by SHM, May 8, 2008. I have a big board, but this is simpel and great. 1982 ts9, early dd2 and a boost. very kool, some great tones in that little board. I love minimalist boards like that - looks great! After playing a gig today with WAY too much gear, I figure that I'm going to build a board like this for small grab and go type situations. I'm thinking exactly like the dude who has dirt, boost, delay, tuner... I was also thinking trem, but is that getting too big already?!? I use the trem in the amp, Vox by the way.